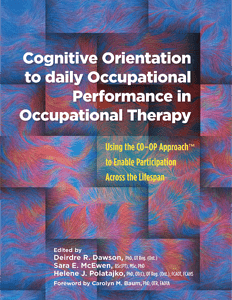 Since its introduction to the scholarly literature in 2001, the Cognitive Orientation to daily Occupation (CO–OP) has provided an evidence-based intervention approach centered on clients’ goals and improving participation. The CO–OP Approach™ has been shown to be effective for various populations—from children to adults—with occupational performance issues, from developmental coordination disorder and ASD to more debilitating neurological conditions such as stroke. This new text brings together in a single source the most current thinking on the CO–OP Approach’s theoretical foundations, active ingredients, and potential mechanisms of action, as well as the most up-to-date evidence regarding efficacy. Building on earlier foundations, this new publication enables readers to deepen their understanding of the CO–OP Approach, learn details about how it is applied with several client populations, and become familiar with the supporting evidence for its application with various populations and in several formats. This book provides in-depth coverage of the CO–OP Approach’s remarkable scholarship along with practical guidance, case examples, and a user-friendly toolkit with forms, scripts, a fidelity checklist, and more to enable readers to use the approach in clinical practice.